Häagen-Dazs wants you to think twice before you inhale your next bowl of ice cream. Believe it or not there is a way to make ice cream taste even better than it normally does. Just throw in the word free before ice and cream and some how those magical nuggets of frozen goodness somehow caress the throat that much sweeter as it works its way past the taste buds and into the stomach. Throw in the words Häagen-Dazs after free and our tongues are sure to turn Pavlovian on us. The high end ice cream chain is offering Free Flavor Day on Tuesday where they will scoop out free ice cream. Does the offer sound too good to be true? Well it is true but of course there is a catch. The frozen treat makers are only handing out flavors that are sweetened by our friends the honey bee. The company said it is honoring "the humble honey bee, responsible for pollinating one out of every three bites the average American eats, including ice cream." What does that mean for you and wallet less pursuit of ice cream? 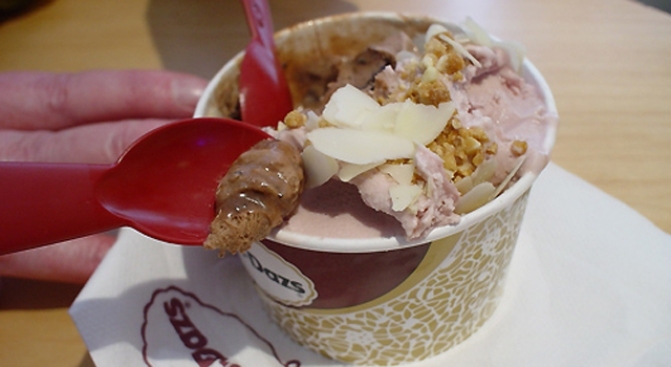 Häagen-Dazs will be serving any bee-built flavors for free. Those flavors include vanilla honey bee, chocolate peanut butter, rocky road, strawberry, vanilla Swiss almond, mint chip, raspberry, strawberry and zesty lemon sorbet. Not a bad variety to choose from. Häagen-Dazs said it wants it customers to realize the importance honey bees play in the diet of everyday Americans and learn about saving the disappearing pollinators. "Honey bees pollinate more than 100 crops of nuts, berries and fruits – key ingredient in nearly 50 percent of Häagen-Dazs ice cream’s all-natural flavors," the company said in a release. "But over the three years more than 1 in 3 bee colonies has died nationwide, which has the potential to affect some of our favorite foods and all-natural ice cream flavors."